Successfully Added Ugoos UM3 TV Box - Android 4.4 + Ubuntu OS, RK3288 28nm Cortex-A17 Quad Core CPU, 2GB RAM, 8GB Internal Memory to your Shopping Cart. The Ugoos UM3 TV Box has an Android 4.4 + Ubuntu operating system, a RK3288 28nm Cortex-A17 Quad Core CPU, 2GB of RAM as well as 8GB of Internal Memory. This TV box has Bluetooth connectivity so you can quickly connect with other devices. 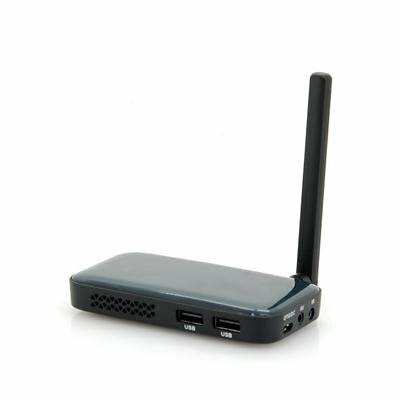 There is dual Wi-Fi band plus this TV box supports DLNA amd Miracast so you can make a strong connection between compatible devices. Ugoos has made sure this TV box can also support 2.4GHz wireless air mouse or remote controllers. There are several ports on the TV box including a micro SD card slot that supports cards of up to 32GB, an AV out, and two USB ports to allow for many diverse ways to connect and view media. Boasting a RK3288 28nm Cortex-A17 Quad Core processor and a dedicated Quad-Core Mali-T764 GPU, this TV box will stream all video content perfectly and even supports various media files including MPEG-4, H.263, H.264, AVS, VC-1, Sorenson Spark and MVC formats. Backing up the 1.8GHz CPU is 2GB of RAM to ensure there is no lagging in the performance when streaming videos or engaging in apps. Transform your television today with the incredible UM3 by Android TV box specialists, Ugoos. 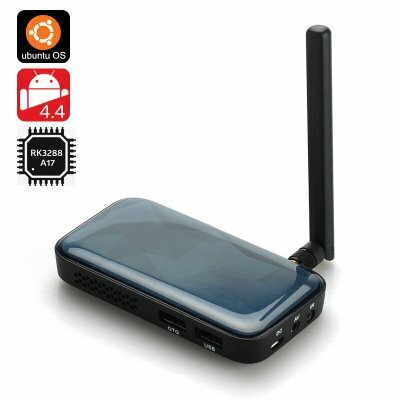 When you turn on this TV box, you will enter the Ubuntu operating system, from there you can decide whether to stay with the Ubuntu system or switch to the Android 4.4 operating system. Ubuntu is a Debian-based Linux operating system and is one of the most secured operating system and defines the highest level of security as compared to other operating system. A major advantage is that Ubuntu is an open source platform.